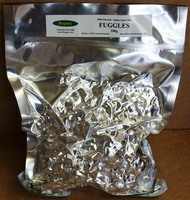 Fuggles Hops for use in home brewing - Vacuum packed for longer shelf life. A general purpose hop, often used when brewing Mild, Brown Ale or Stouts. Vacuum packed for longer shelf life. A general purpose hop, often used when brewing Mild, Brown Ale or Stouts, or in conjunction with Goldings in Bitters. Fuggle was the dominant hop variety in Britain for over 70 years and this probably accounts for its widespread use in many recipes. Grown originally in Kent, it is now mainly grown in Herefordshire and Worcestershire and in Slovenia as Styrian Golding. Used for both bittering and aroma Fuggle hops produce a clean, refreshing, full bodied flavour with a delicate, minty, grassy, slightly floral aroma. Its typical alpha acid levels are 4.0-5.5% depending on the harvest, so you may need to adjust the amounts used in your recipe to ensure that you match the target EBU value.